Bottleneck Gallery is not messing around this Halloween as they are about to release an insane line up of new screen prints today! 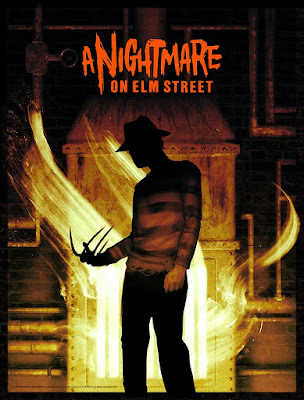 This includes this fantastic A Nightmare on Elm Street movie poster by Sam Wolfe Connelly. There have been a lot of officially licensed prints for Nightmare on Elm Street the past few years, but this one may be the best yet! I love how Sam uses shadow to give Freddy Kruger an added sense of mystery along with his natural scary self. A Nightmare on Elm Street by Sam Connelly is an 18”x24” hand numbered screen print limited to just 125 pieces. This awesome movie poster will go on sale at 12pm EST today, October 31st, at the Bottleneck Gallery online store for just $40.